Park your own car? There’s valet! And once you’re whisked out of your car, humongous double wood/glass doors enter you into the world that Insignia. That’s right. It’s like entering a whole other world. Established in 2011, this is the branch of a tier of Anthony Scotto’s Long Island-owned fine dining restaurants, including Blackstone in Melville and Rare650 in Syosset. And you can’t miss this restaurant when you drive by on busy route 347. And that’s exactly how I could describe Insignia: a Hamptons’ mansion with a cosmopolitan flair. The host and hostess up front welcomed my family with warm smiles and the hostess brought us right over to our table, taking the time to pull out the chair for my mom and help her get seated. Instantaneously, a team of waiters flocked to our table. Fresh sliced bread with a spicy tomato sauce to spread came from one of the “team,” another gentleman came over to take our water order (bottled or tap). 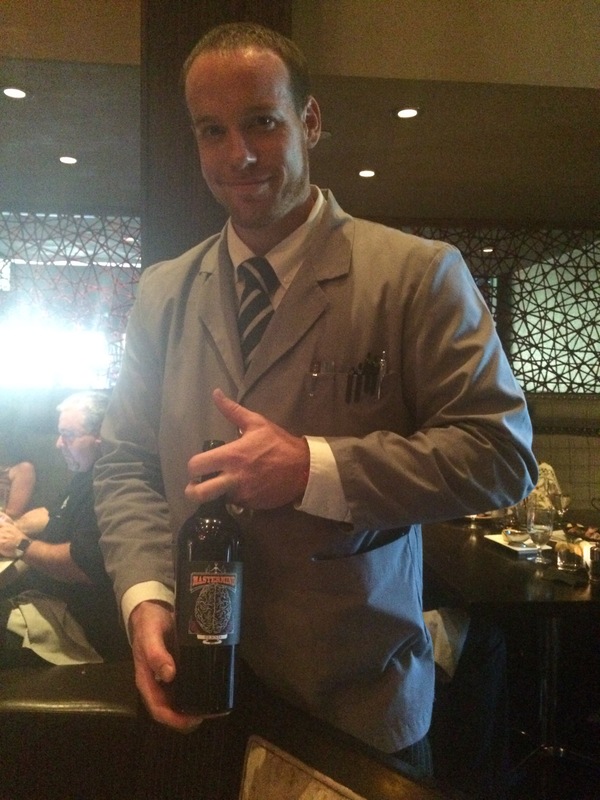 One of the waiters let us know that all night our team would take care of our every need during our experience. And boy, were they right. Before I gush some more about Nick and Robert, it’s time to get to the main event in this tale of hospitality: the food! As it has a gorgeous sushi bar in the back with lamps hanging over the bar that look like ice cubes, I knew the sushi would be a hit. My sushi roll was steps above all other sushi places I have tried on the Island thus far: from the texture of the rice to the tuna inside it to the fresh ginger and wasabi (which I’m SO glad there’s wasn’t a huge glob of it), every facet of the roll tasted light, airy and fresh. The same goes for the fried calamari and shrimp: light, crispy, crunchy morsels of fresh fish, seasoned beautifully. The creamy garlic Jalapeño sauce was the perfect pairing! It was so addicting I wish we had more of it. Not overly strong on the garlic, which wasn’t a bad thing. Simply delicious. After the team of waiters cleared our appetizer plates, Robert came by with a tray of steak knives for us. It was a sign of the epic feast about to happen. The steak came sliced with the HUGE bone on the side. The other sides pictured here are mashed potatoes and creamed spinach. House made steak sauce was also served on the side. Epically excellent. My filet mignon while resting cooked to the temperature I desired (medium rare – medium). The flavor of the steak resonated with me; it had a great depth of flavor. It cut like butter. The spinach wasn’t overly creamy which I loved. It had a fresh taste which stood out from other creamed spinaches you get at steakhouses. The mashed potatoes were creamy, as my mom described. The mac and cheese was my favorite side! I love cheese, and this was elegant mac and cheese, as my mom described. The truffle flavor wasn’t overpowering, which was a huge gold star for the dish, along with the creamy cheese sauce, seasoning and pasta all baked together in a cast iron dish. An unforgettable meal. Don’t worry about not getting your money’s worth, because trust me, you will! I was full after eating a few helpings of my mac and cheese along with all of the other sides and the steak. I wish we had room for the gorgeous desserts that kept flying out to other tables next to us. But the real question is, how did my dad love his meal? He was all smiles. To me, that says it all. As Father’s Day comes to a close, I must give a shoutout to my dad, pictured above. He is one of the most hardworking men I know, along with being a huge gentleman. I love my dad very much, and I’m so glad we all got to spend this day with you at an unforgettable destination. And on a side note about Insignia, the restaurant also hosts private events such as bar mitzvah’s and weddings! What an incredible place to do it, from the decor to the gorgeous wine cellar which sits above all of the tables in-between the main dining room and bar. Check out its separate events site, here. If you do head to INSIGNIA, which I truly hope you do after reading this post, I want to point out the Promotions section of its website. There are several days throughout the week where you can score some great deals on food, including a $55 a person 3 course dinner for two with filet mignon AND a lobster. To sum up tonight: it was epic, the hospitality was on point and the food and wine were outrageously delicious. Basically, you need to go.